IDCTA is pleased to join with area stables to present the IDCTA Schooling Show Series. In general, it will be a reflection of typical USEF/USDF/USEA recognized shows. Our goal is to help all riders feel more comfortable showing and to provide a year-end goal at a local level. If you should decide to show at a recognized show in the future, hopefully you will find this series has prepared you. Listed in the IDCTA Schooling Show Omnibus are prize lists for all shows offered in the series. Each stable has the right to set their own policies regarding fees, refunds, stabling, warm-up areas, parking, pets, etc. Read each prize list for details. Each show must offer the basic classes that IDCTA recommends. They may offer additional classes. Show management shall act as the Technical Delegate (TD) and have authority of a TD. A current, negative Coggins is mandatory. Please make copies of the entry form included in the Omnibus. Mail completed entries to the show secretary, not IDCTA. Refunds will not be issued for any reason after the closing date. The schooling shows offered in this series are managed by and are the sole responsibility of the respective facility. The IDCTA is not responsible for policing show managers or facilities regarding how to run their shows. The IDCTA encourages riders to vote with their entry fees at shows which are safe, fun and which offer appropriate learning experiences. 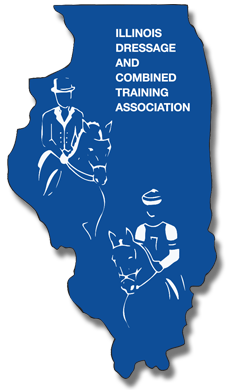 Additionally, the IDCTA encourages riders to volunteer and learn what is involved in managing a show. If you have questions about the schooling show series, please contact the schooling show coordinator, Cecelia Conway at ceceliaconway2@gmail.com. Go to www.idcta.org, click on “Membership Application” and register or renew your membership on-line! Adult Amateur: Competitors shall compete as Adults from the beginning of the calendar year in which they reach the age of 22. An Adult Amateur does not accept payment for teaching lessons, training or showing horses for others. Junior/Young Rider: Competitors are Junior/Young Riders until the end of the calendar year in which they reach the age of 21. Open: Competitors who accept payment for teaching lessons, training or showing horses for others must compete in the Open Division or compete Hors de Concours. Classes will be divided into Adult and Junior/Young Rider Divisions if entries warrant. Classes will not be divided unless at least 3 riders remain in each class after the split. For example, if there are 5 adults and 2 juniors, the class will not be pinned separately because only 2 juniors would remain after the split. A class with 3 adults and 3 juniors would be split and pinned separately. FINALS: At the end of the schooling series, a dressage and combined test show with Championship Classes and a Mini Event with Championship Classes will be held at the facility listed in the current omnibus. Anyone may participate in these final shows of the season, but to ride in the Championship Classes at the finals, you must qualify by riding in the IDCTA Schooling show series and be a member of the IDCTA at the time you ride your qualifying tests. Remember, tests in the Championship Classes must be ridden without whips and from memory. Winners of the Championship Classes will be presented with ribbons and prizes at the Championship shows and will receive certificates of merit at the annual IDCTA banquet in January. To qualify, you need a total of two scores of 60% or higher in any test at the same level which were earned at two different shows from two different judges. It does not matter how you place in the class, only your score counts. With your entry form for the Championship Classes, send copies of your two tests from the same level with scores of 60% or better earned at two different shows from two different judges. Although you may ride any test in a level to qualify, the test specified here for each level will be the one ridden in the championships. Once a horse/rider combination wins a championship, they may no longer compete at that or a lower level at championships. To qualify, you must place in the top five of your class at one show. Have the show secretary mark your placing on your test and sign it. With your entry form for the Championship Classes, send a copy of your test where you placed in the top five of the class. Cross Country: No combinations, No Ditch. Water – may be used – pass thru only. All Combined Test and Mini Event classes listed above must be offered at the championships. All other CT and Mini Event organizers are encouraged to offer all classes but it is not mandatory. Everyone is welcome to attend the annual IDCTA awards banquet in January which is intended to recognize accomplishments of horses and riders at USEF/USDF/USEA recognized competitions. This schooling show series acknowledges its champions with impressive ribbons and prizes at the year-end championship shows. That being said, Mini Event competitors also have their very own awards category at the annual banquet! Go to the “Printable Forms” page at www.idcta.org, under the “Awards” category, print the Eventing Reporting Form, fill it out and have the show secretary verify the information by signing the form. By October 31st, submit a form for each Mini Event you attend along with the Volunteer Hours Form showing you have completed at least 5 hours of volunteer work at an IDCTA sanctioned event. For details on how points are awarded and tabulated, read the Eventing Rules also available on the IDCTA web site. It is the rider’s responsibility to know the rules before entering a competition. The IDCTA strongly recommends that you read Chapter DR (Dressage Division) and Chapter EV (Eventing Division) of the USEF Rule Book. A copy of the USEF rules may be obtained from their web site free of charge www.USEF.org (click on “rules”) or by calling USEF at 859-258-2472. Two other web sites that may be helpful are www.USDF.org (the United States Dressage Federation 859-971-2277) and www.eventingusa .com (the United States Eventing Association 703-779-0440). Cruelty to or the abuse of a horse is forbidden (Sections GR839 & EV111 USEF Rule Book). The following acts are examples of cruelty. 1. Excessive use of a whip, spurs and/or bit on any horse. 2. Except in emergency situations, any striking of a horse in front of the shoulder with the whip shall be deemed excessive as shall hitting a horse more than three times for any one incident. 3. Showing a horse with raw or bleeding sores around the coronets, pasterns or legs. 4. Riding an exhausted horse or excessive pressing of a tired horse. 5. Riding an obviously lame horse. 6. Inhumane treatment of a horse. For this schooling show series, a horse or pony may compete in no more than 4 classes per day. Attire & Equipment (Sections GR801 to GR803; DR120 & DR121; EV114 & EV115 USEF Rule Book): It is the tradition of the competition ring that riders be correctly attired for the class in question, that attendants be neatly dressed and horses be properly presented. 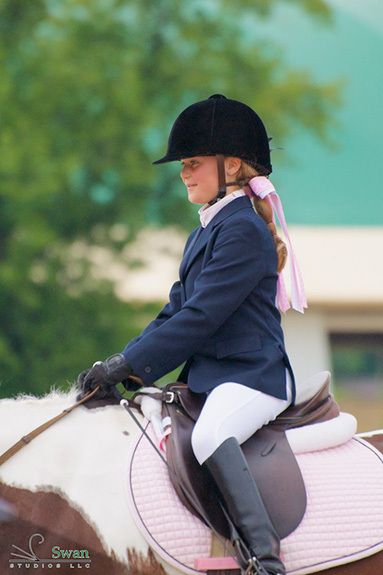 In the spirit of schooling shows, riders will not be required to wear a coat and stock tie; however, you MUST wear boots, protective headgear which meets or exceeds ASTM/SEI standards and is properly fitted with harness secured, conservative colors, a sleeved shirt tucked in your breeches, and a vest during the cross country phase of a mini event. Half chaps may be worn. Whips: In all dressage classes except championship classes, riders may carry a whip including lash no longer than 47.2 inches (120 cm) for CTs and Mini Events, or 47.2 inches (120 cm) for dressage (see USEF rules DR120.7 & EV114.3). Whips carried in the Cross-Country and/or Jumping Tests may not exceed 30 inches (75 cm) in length (EV114.3). For spurs and bits allowed, see USEF rules DR120.10, DR121.2 and Figure 1 for Dressage and USEF rules EV114.4 and EV Appendix 4 for Eventing. Saddles may be any English type, and you MUST ride in a plain snaffle bridle. Schooling “gadgets” will not be permitted. Running martingales must have rein stops. Standing martingales are not allowed (EV115). It is forbidden for anyone other than the competitor who will ride the horse in the competition to school the horse at the competition (EV108.2.a). Before the cross-country course or jumping course has been opened to competitors, it is forbidden to inspect the obstacles. Once opened, competitors may walk the course without their horses (EV109). Jumping practice fences that are not flagged or jumping practice fences in the wrong direction (EV108.3.d) may result in disqualification. Remember, the red flag must be on your right and white flag on your left as you’re jumping over the obstacle (EV148.2). 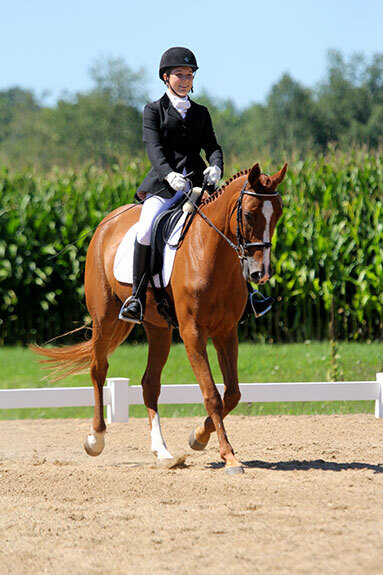 Dressage tests in mini events and combined tests must be carried out from memory — readers are not allowed (EV134.2). In the Cross-Country phase, at obstacles or elements with height (exceeding 30 cm), a horse is considered to have refused if it stops in front of the obstacle to be jumped. At all other obstacles (i.e., 30 cm or less in height) a stop followed immediately by a standing jump is not penalized, but if the halt is sustained or in any way prolonged, this constitutes a refusal. The horse may step sideways but if it steps back, even with one foot, this is a refusal (EV142.2.a). In the Jumping phase, it is a refusal when a horse halts in front of an obstacle whether or not the horse knocks it down or displaces it. Stopping in front of an obstacle without knocking it down and without backing followed immediately by a standing jump is not penalized. If the halt is prolonged, if the horse steps back, either voluntarily or not, even a single pace, it counts as a refusal (EV150.6).